Pasadena, CA-(ENEWSPF)- Call it a Saturnian version of the Ouroboros, the mythical serpent that bites its own tail. In a new paper that provides the most detail yet about the life and death of a monstrous thunder-and-lightning storm on Saturn, scientists from NASA’s Cassini mission describe how the massive storm churned around the planet until it encountered its own tail and sputtered out. It is the first time scientists have observed a storm consume itself in this way anywhere in the solar system. 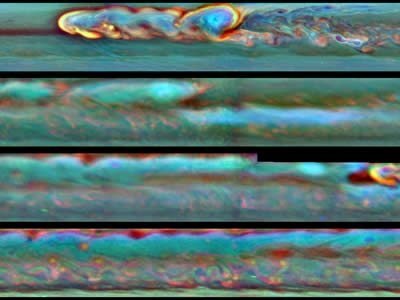 "This Saturn storm behaved like a terrestrial hurricane – but with a twist unique to Saturn," said Andrew Ingersoll, a Cassini imaging team member based at the California Institute of Technology, Pasadena, who is a co-author on the new paper in the journal Icarus. "Even the giant storms at Jupiter don’t consume themselves like this, which goes to show that nature can play many awe-inspiring variations on a theme and surprise us again and again." Earth’s hurricanes feed off the energy of warm water and leave a cold-water wake. This storm in Saturn’s northern hemisphere also feasted off warm "air" in the gas giant’s atmosphere. The storm, first detected on Dec. 5, 2010, and tracked by Cassini’s radio and plasma wave subsystem and imaging cameras, erupted around 33 degrees north latitude. Shortly after the bright, turbulent head of the storm emerged and started moving west, it spawned a clockwise-spinning vortex that drifted much more slowly. Within months, the storm wrapped around the planet at that latitude, stretching about 190,000 miles (300,000 kilometers) in circumference, thundering and throwing lightning along the way. Terrestrial storms have never run into their own wakes – they encounter topographic features like mountains first and expend themselves. But Saturn has no land to stop its hurricanes. The bright, turbulent storm head was able to chomp all the way around the planet. It was only when the head of the storm ran into the vortex in June 2011 that the massive, convective storm faded away. Why the encounter would shut down the storm is still a mystery. By Aug. 28, after 267 days, the Saturn storm stopped thundering for good. While Cassini’s infrared detectors continue to track some lingering effects in higher layers of Saturn’s atmosphere, the troposphere — which is the weather-producing layer, lower in the atmosphere – has been quiet at that latitude. "This thunder-and-lightning storm on Saturn was a beast," said Kunio Sayanagi, the paper’s lead author and a Cassini imaging team associate at Hampton University in Virginia. "The storm maintained its intensity for an unusually long time. The storm head itself thrashed for 201 days, and its updraft erupted with an intensity that would have sucked out the entire volume of Earth’s atmosphere in 150 days. And it also created the largest vortex ever observed in the troposphere of Saturn, expanding up to 7,500 miles [12,000 kilometers] across." The vortex grew to be as large as the giant storm known as Oval BA on Jupiter. But Oval BA and Jupiter’s more famous storm – the Great Red Spot – are not thunder-and-lightning storms. Jupiter’s storms also have a quiet center, unlike the violence at the center of Saturn’s storms. "Cassini’s stay in the Saturn system has enabled us to marvel at the power of this storm," said Scott Edgington, Cassini’s deputy project scientist at NASA’s Jet Propulsion Laboratory in Pasadena, Calif. "We had front-row seats to a wonderful adventure movie and got to watch the whole plot from start to finish. These kinds of data help scientists compare weather patterns around our solar system and learn what sustains and extinguishes them." This storm was the longest running of the massive storms that appear to break out in Saturn’s northern hemisphere once every Saturn year (30 Earth years). The longest storm of any size ever detected on Saturn actually unfolded over 334 days in 2009 in an area known as "Storm Alley" in the southern hemisphere, but it was about 100 times smaller in area than the latest northern storm. The Cassini-Huygens mission is a cooperative project of NASA, the European Space Agency and the Italian Space Agency. JPL manages the mission for NASA’s Science Mission Directorate, Washington. The Cassini orbiter and its two onboard cameras were designed, developed and assembled at JPL. The imaging team consists of scientists from the U.S., England, France and Germany. The imaging operations center is based at the Space Science Institute in Boulder, Colo.
For more information, visit: http://www.nasa.gov/cassini and http://saturn.jpl.nasa.gov.